An auto-updater tool has been created by Truuuc which automates the procedures below. For Maxthon 5.x & 4.9.x follow the instructions in this post. Open an Explorer window (Win+E) and go to the folder you installed Maxthon to, then navigate to the \Core\Blink\plugins folder. If the threads are locked please PM a Mod to reopen them. This ensures all the related information stays in the one place. Should the above not work, you can try copying the NPSWF32_XX_X_X_XXX.dll file from C:\Windows\Syswow64\Macromed\Flash (for 64bit) or C:\Windows\System32\Macromed\Flash (for 32bit) and paste it into Core\Webkit\Npplugins. 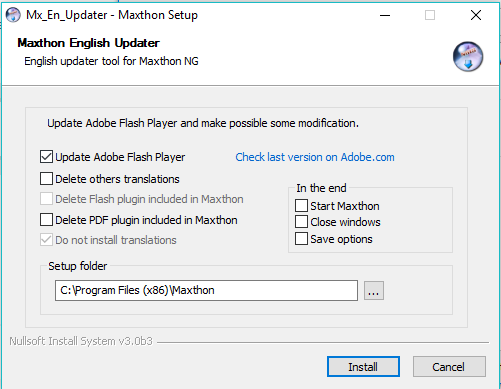 No installation but you need to run it after each maxthon update.